Obesity continues to be a growing problem globally among all age groups, further associated with life threatening co-morbidities. Resistant Starch (RS) as a dietary component has been recently recognized as a prebiotic with potential role in improving the bacterial ecology of human gut. 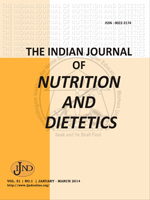 The present study was undertaken to evaluate the impact of resistant starch supplementation by the obese adults in urban Vadodara on microbial changes in gut flora with respect to Bifidobacteria and Enterobacteria. Using a non randomised control trial study design, 60 obese adults were enrolled from the free living population of urban Vadodara. Baseline information was collected and subjects were classified into control (n=30) and experimental group (n=30). Experimental group was supplemented with 10 g of RS daily for the period of two months (60 days). The control group were not given anything during this period. Blood and stool samples were analysed for lipid profile and the presence of Bifidobacteria and pathogenic Enterobacteria, respectively both at baseline and after the intervention period. Results revealed a significant increase in the mean log counts of Bifidobacteria by 11.7% with no significant reduction in the mean log counts of enteric pathogens and lipid profile of subjects. Hence study concludes that a daily supplementation of 10 grams of RS for 60 days to the obese subjects improved colonization of beneficial gut microbiota in terms of Bifidobacteria, but had little effect on obesity. Resistant Starch, Obesity, Bifidobacteria, Enterobacteria, Prebiotic.